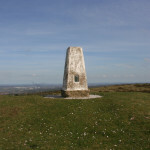 Pen-y-Ball Monument sits on an important Medieval smelting site. Lead ore was put into simple stone furnaces, or 'boles', which were dug on high ground. Fanned by strong winds, their fires burned hotter and brighter. These spectacular limekilns produced large amounts of hydraulic lime used to build docks at Liverpool, Birkenhead and Belfast. Halkyn is an ancient settlement and there has been a church here for over 800 years. 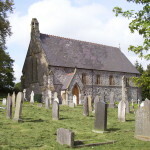 The present church was built by the Duke of Westminster for the parish in 1878. 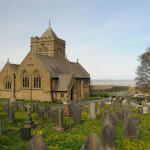 Reputedly the earlier church was demolished to improve the view from Halkyn Castle that he had built nearby! 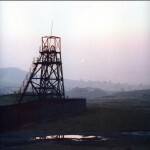 In the first half of the 20th century Pen-y-bryn was the main Halkyn Mountain lead mine. The buildings and head frame were removed after the mines fully closed in 1987. The earthen banks encircling the summit of Moel y Gaer are the remains of an Iron Age hillfort, begun 2500 years ago. 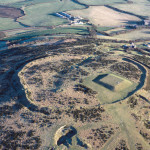 The communities lived within the protection of the banks in a 'village' of wooden roundhouses with rectangular buildings that were possibly granaries. The village of Rhosesmor grew in the 1800s when lead mining was flourishing.The church was built of local limestone in 1874. This is the highest point on the mountain, at 290metres above sea level. 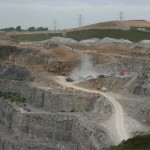 About 800,000 tonnnes of limestone is quarried each year, mainly used in the construction industry. Come and explore Halkyn Mountain and enjoy fabulous views over the Dee Estuary and the Clwydian Range. This wild open landscape has never been enclosed and is still common land. Around 200 properties hold commoners rights including that of pasture and over 1500 sheep graze the common, keeping the gorse and bracken in check and maintaining the open character of the landscape. You can wander freely over the Common but there are also plenty of public footpaths that were created years ago by people going about their daily business, on their way to work and school, or to church or chapel on Sunday. The Lead and Limestone Trail explores the central area of the Common where you can find interesting rocks and evidence of lead mining and quarrying. It is also a good place to see some of the special flowers that grow on the mountain. The Learning Zone has lots of information on lead mining, quarrying and what it was like to live on Halkyn years ago. There are also some fun games and activities for you to try. Halkyn Mountain Common is owned by Grosvenor Estates and is designated a Special Area of Conservation so please check the Code of Behaviour before you visit. Why not round off your exploration of Halkyn Mountain with a cup of tea, drink or meal? NB Opening hours can vary and landlords can change so please check website or phone beforehand if possible.